They recently completed projects for food security for rural families in the village of El Triunfo, Ecuador, implemented by HPP Ecuador, Humana local partner in this country. 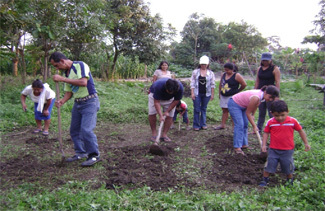 In total 66 families have participated, 36 of them a collaboration of the City of Villacañas and 30 by the City of Sax. One of the objectives of this project was the commissioning of small organic gardens to produce great diversity of plants, by their own families. The initiative has also simultaneously with a training activity in agriculture, nutrition and management of the household economy, which has ensured the smooth operation and maintenance of gardens, in addition to promoting healthy eating habits among all members family. The 66 families have access to a variety of foods, nutritious and safe during the implementation period, and increased consumption of vegetables, improving their diet rich in protein and essential nutrients. To do this, they have 10 varieties of vegetables grown in an area of ? ?10 m square metres, used sustainable agricultural techniques, such as compost and natural pest control organic repellents that acts as a barrier to plant basil, lemon grass or rough. The program results have been very positive, because these families will continue to agricultural activity, with access and availability of safe and nutritious food throughout the year. At the same time, has encouraged the development and community participation, empowerment as project managers, their actions and their achievements. In this sense, not only these families were the beneficiaries, but relatives and neighbors have been able to access the knowledge acquired during training, as well as seeds and harvested food.